What can we expect from a HF propagation model ? Propagation forecast generated by DX ToolBox for the 15-m band on February 1, 2002 at 1400 UTC. What can we expect from a propagation prediction program ? What is the objective of such a program ? What are mandatory parameters to calculate a propagation prediction with more or less accuracy or reliability ? What are the most useful charts to estimate an opening toward a DX country ? Here are some among the many questions at which we will answer to help you selecting your propagation prediction program. In saying this, that means that you have the choice between not only several applications but that each of them shows probably more or less features and accuracy. To answer to this question we must thus extend your scope and come back to the origins of these applications to see what geophysicists expected from the original programs, how they have improved them, and with what degree of accuracy and reliability. An ionospheric model is synonymous of numeric forecast. This forecast is qualified of "numeric" because the state of the ionosphere is described by series of numbers and physic laws by operations on these numbers, the whole being processed by supercomputers. The method of forecast consists in representing the ionosphere evolution by a set of basic physic laws, functions that try to represent at best some specified dynamic processes that develop in the ionosphere. When we speak of radio propagation we have to consider all interactions between the Sun surface and that of of Earth. This "working space" includes the sun model, the space weather model, and the ionospheric model without to speak about the atmospheric model that can be useful to understand the propagation on the top band of 160 meter. Often these master models work with smaller models dedicated to a specific process or covering only a small location, the master handling the global computations at large scale and data exchange between models. 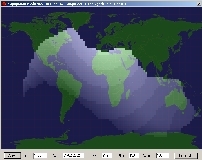 At left, like in meteorology where the atmosphere is cut is slices more or less extended and thick depending on the available data and the required accuracy, a perfect ionospheric model could also divide the ionosphere in small volumes in which each variable and its interactions are processed, then injected in the international ionospheric reference model in which will appear small ionization islands and large scale interactions, all we need to get an accurate forecast. This model is under development and operational, it is called IRI. 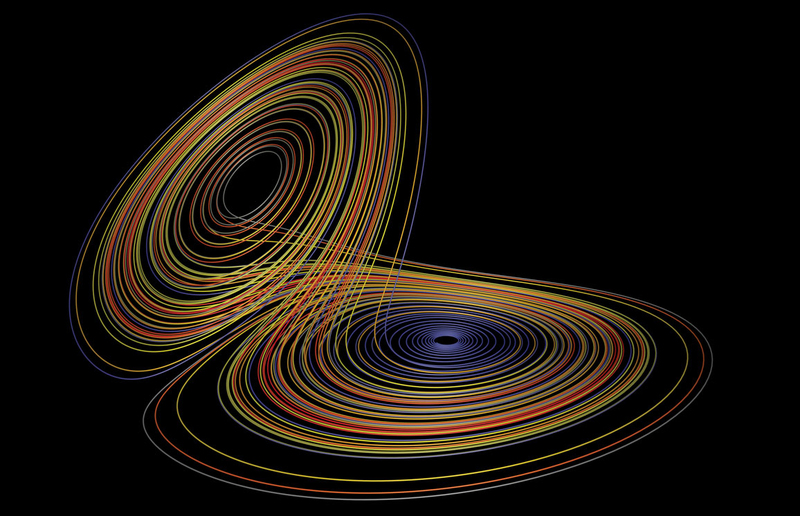 At right, a Lorentz's strange attractor, or how a small "thermodynamic butterfly" can affect a global system... Like Murphy's Law, the butterfly effect is never far away to refute your obervations. Documents Météo-France and Paul Bourke. Up to now, these three or four models exist at various scales but do not exchange their data. It is even inthinkable to develop a super meta big "sun-earth plasma model" taking into account all solar, space weather, geomagnetic, geophysical and weather conditions, all the less that additional models will be proprably added to the code to improve its accuracy. These "add-ons" can be as numerous as Windows fixes, Hi ! The reason is obvious, too many variables are to be considered in the three dimensions. 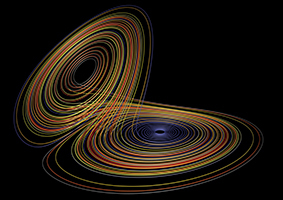 Worst, they are interdependent, variables interact each others applying in force the laws of thermodynamics, including the famous "butterfly effect" : a small variation in the initial conditions will amplify with time, transforming for example the simple electron rotation in a huge malstroem some months later. Hard in these conditions to forecast anything with accuracy over some times without to get erratic results. In the field that means that today we cannot inject all data in this "black box" with the hope to get in output a complete prediction covering any communication circuit and any coverage. But maybe after tomorrow, if someone if smart enough to develop this interface and pay for this supercomputer which blueprint does no exist yet, Hi ! Constrained by our limited mind and the size of computers (memory, disk space, CPU speed), we must thus reduce our scope and only inject in our model a representative amount of data of the real conditions, what represent already a long list of parameters that we are going to review. The IRI model 2001 is rather performing and it has permitted to derive some well-known models dealing with a specific process or variable like the electron density model, electron temperature model, auroral precipitation and conductivity model, F2-peak model, CCIR noise model, etc, each of them including other models constituted of tens of functions. Here we are in an environment far from the ham shack : our colleagues are mathematicians, statisticians and engineers and prefer to compute differential equations than working on the air, Hi ! Why simulate HF transmissions ? Scientists want to simulate HF transmissions to better understand the behaviour of the ionosphere and effects of radio propagation on communication circuits that can be two remote radio stations sometimes separated by an ocean or by the night. Thanks to supercomputers, simulation programs have been quickly able to show propagation effects with a great accuracy in 2D or 3D. A side-view of propagation paths of sky waves at a frequency of 12.45 MHz for elevation angles from 5 to 50°. The dashed line indicates the electron density profile. Documents realized by Andreas Schiffler on a home computer using a ray tracing program solving a set of differential equations. Today, in fact since the '70s and the pioneer works of the broadcasting company the Voice of America, these programs have been down-sized and are available for PCs. Thanks to these tools, a novice can easily understand what happens above his head in running simply a propagation program. At the remark of his correspondent, "you know, this blooming low band is closing down again... I don't really understand why ! ", he could for example very soon answer him "indeed, this happens because the LUF is raising to this frequency and the D-layer absorbs too much shortwaves. That will last half an hour then the band will be as clear as this night with stronger signals". With this knowledge this amateur will be quickly consecrated "propagation guru" among his friends, Hi ! These simulation tools give indeed the amateur the opportunity to foresee in a few keystrokes the propagation for any future date, to review previous propagation conditions or to compare different working conditions to improve his or her knowledges in this matter. These programs offer a great interest for contesters and DXers too because they permit them to plan in advance the best bands to work depending on time of the day and the frequency. We will come back of this use. 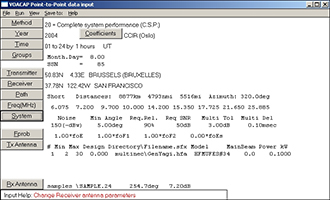 A good simulation program also permits the ham operator to see how different equipments affect his or her signal strength at the receive location or the radiation coverage across lands and oceans. 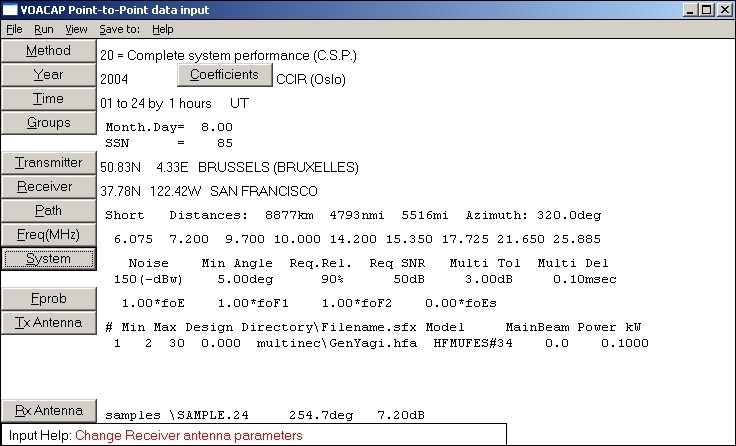 You can also use such programs before buying a new antenna for example, to simulate effects on transmission coverage of a beam vs. a vertical. But often these features are not available in the simplest programs. Once you are used to play with these applications, from a first sight complex, these programs appear eventually to be much simpler than expected and also fun to work with if you are looking for accurate predictions. Funny ? That right, because as soon as you put the finger on the right variable(s) that affected your signal, you improve in the same time your knowledge of the ionosphere behaviour under specific conditions, and it will no more look to an "ionospherica incognita" as it still looks like to in the mind of most amateurs. But more interesting, in working with a propagation program you do no more loose your time in calling "CQ DX" in a dead band and thus you learn to work smarter on the air in appreciating still better your hobby. For years astronomers of the visible or unvisible univers (so-called white light and radio) are monitoring the sun activity, recording day after day the sun conditions, the number of sunspots, the occurence of sunflares, prominences, CMEs, properties of the solar wind, and other cataclysmic event to better understand the sun dynamic and improve the accuracy models. In parallel geophysicists are checking the status of the geomagnetic field and the atmosphere, geomagnetic disturbances and other physico-chemical alteration affecting the ionosphere and the upper layers of the atmosphere. 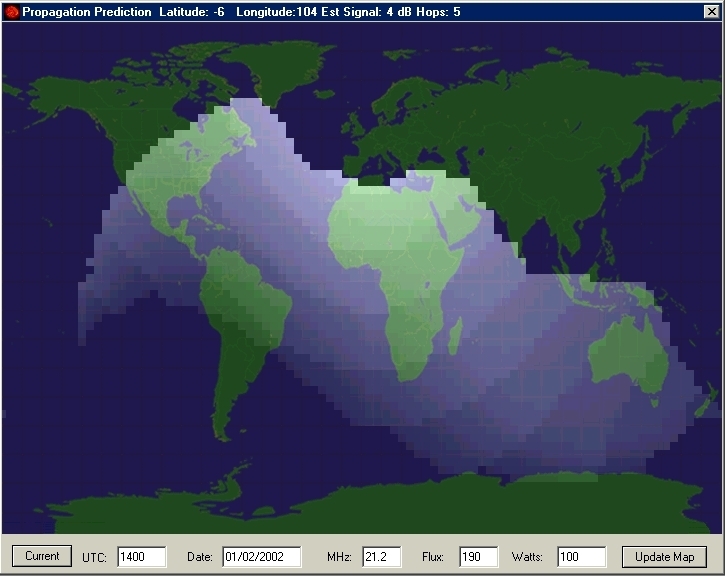 Thanks to satellites orbiting earth, antenna dishes, servers, repeaters and Internet relaying data between observation sites and observatories, today these readings are automatic checked by triggering procedures that immediately warn the concerned people when the sun or the geomagnetic activity reaches a threshold. These activity reports are then displayed in charts are released several times per day to the scientific community and the public. Unfortunately, ham magazines being published monthly, data are already almost obsolete when you read them or give you only a rough estimation of the conditions to come; the K-index is a short-term forecast valid 3 hours only and the median A-index value is updated daily. So if you trust in these tables you could never get an accurate propagation forecast or discover an opening, just there, in the 20m band in two hours or tomorrow morning. In the U.S.A., to get a forecast faster you can also rely on messages transmitted ny NIST on the air on WWV frequencies (e.g. 2.5, 5, 10, 15 and 20 MHz on week days) each 18 and 45 minutes past the hour. Here is a recording of the WWV signal of 10 kW emitted at 09:00 GMT at 5 MHz. If you heard it, you have chance to fine tune your forecasts. Since the launch of the first satellite in 1957 and the use of computers, over the years the amount and quality of data collected by professionals have much improved. Thanks to all these online and updated data, they have created better quantitative and analytical models of the ionopshere than in the past, say before the '80s. Aha ? will tell the amateur, rising suddenly his nose from his WWV predictions... This interest from the ham community for radio propagation programs leads us to review whether or not amateur propagation programs are capable to provide accurate forecasts from this wide variety of inputs. Historically, how all this began ? In 1969, the american Institute for Telecommunication Sciences from the National Telecommunications and Information Administration (NTIA/ITS) published a technical report dealing with algorithms to use to predict long-term HF propagation conditions. Immediately some smart people, engineers and physicists, extracted the best elements of this report to develop the kernel of the future ionospheric model. Some years later, from this information some amateurs developed their own point-to-point propagation programs, like Prof. Geoff West's GWPROP that was released... 17 years later. Evolution of propagation prediction software for amateurs. At left, MINIMUF for DOS released in the December 1982 issue of QST vol.66 for the first IBM PC computers. At center, DXAID developed by Peter Oldfield in 1996 showing the auroral oval among other screens. 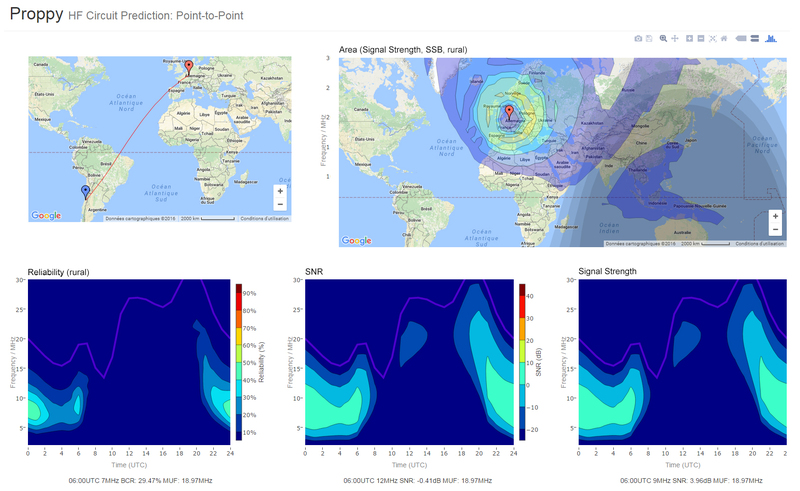 At right, propagation forecasts calculated with VOACAP online available since 2010 on the web for a point-to-point link between LX and HZ on August 2016 using a dipole and 100 W in SSB (above right). This technical report was is fact the blueprint and grandfather of IONCAP. In 1983, the first IONCAP model was developed by Teters and al. from NTIA/ITS, soon replaced by an enhanced version developed by Voice of America for broadcasting purposes, and know as the VOACAP model or engine. The product is always under development, except that today fund are no more available but always accepted. The product is thus only supported on email basis. 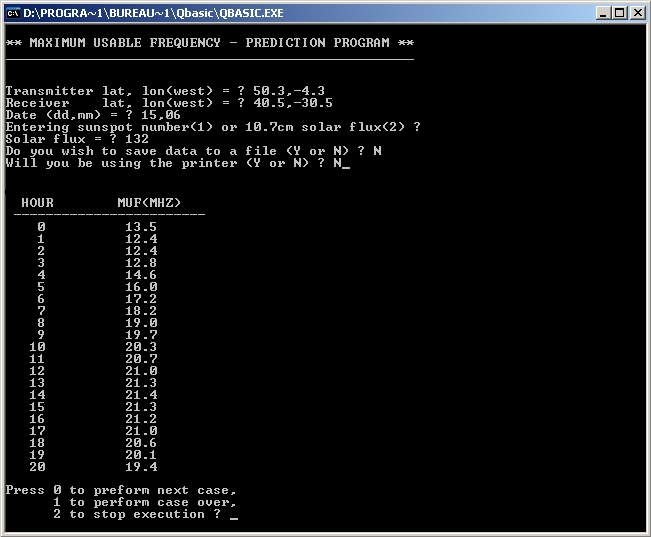 From 1982 amateurs have had the opportunity to use the first DOS programs like MiniMUF from NOAA, that evolved to MicroMUF. On its side at the same time MiniProp was very appreciated too because it was much easier to use than a product like DXAID for example. Based on the F-region method used by Fricker in his IONPRED model, MiniProp evolved to MiniProp Plus that displayed the gray-line and an approximate auroral oval (it didn't use a K-index function like DXAID), until W6ELProp was developed for the first Windows environments. In parallel, in the late '70s the International Reference Ionosphere, IRI, was down-sized to run on the first IBM microcomputers. In the years '90s the most well-know program using this PC version was DXAID by Peter Oldfield, soon copied but never equaled. It was probably the best HF propagation program developed for amateurs. Already at that time it took into account the solar and geomagnetic conditions and thanks to accurate functions was able to forecast the auroral oval and any DX propagation at short-terms. Today only DXAtlas and similar products reach this quality. Propagation forecasts calculated with Proppy released in 2016 by James Watson (M0DNS/HZ1JW), for a point-to-point link between LX and CE on August 2016 for an isotropic antenna and 100 W in SSB. The area prediction is also calculated (the world map above right). Today, following the hardware evolution and specially the performances of new chips, some of these programs have improved their algorithms and graphic user interface, they include much more functions and some are interfaced or exchange their data with other products or even with telecommunication devices when they are used by the U.S. Government. As listed in my review of propagation analysis and prediction programs, these programs counts by tens and have been developed for most operating systems from Windows to Mac OS and Linux. Today VOACAP is available in two versions : one to install locally on a computer running under Windows, Mac OS X or Linux, and an online version a bit lighter available since 2010. Both versions are always very appreciate by the ham community, military and broadcast stations. At last, in 2016 James Watson (M0DNS/HZ1JW), responsible for porting the VOACAP Fortran code from the Salford to the GCC compiler developped Proppy. The name is derived from "Propagation Python" (Proppy). 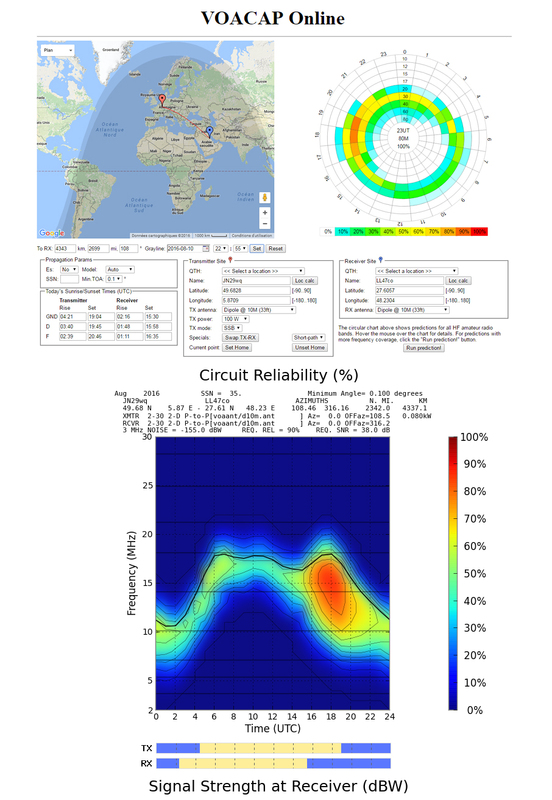 Using a web interface similar to VOACAP Online but simpler, it differs from this latter by using the ITURHFProp prediction model (formely REC533) to calculate performances of HF circuits in accordance with Recommendation ITU-R P.533-13) provided by the ITU. The P.533 library is thus a separate application to VOACAP but unlike VOACAP, P.533 is well documented and actively maintained by a professionnal body. The ITRHFProp codebase is currently closed source although comprehensive details of the algorithm are available on ITU website. Proppy is thus an alternative to VOACAP. Unfortunately most of these programs take into account only one parameter, the smoothed sunspot number (SSN) or its equivalent, the solar flux (SFI). Very few, say less than 20%, use values of the geomagnetic field (Ap and Kp) considered as "useless". But it must be known that magneto-ionic effects become important on 160 meters, where the frequency (about 1.8 MHz) is close to the gyro-frequency of ionospheric electrons. Atmospheric noise and weather conditions also affect much the top band. In addition, the K-index affects the propagation near polar caps and is thus a parameter that developers must take into account to get accurate resultats in all working conditions that might experiment amateurs. Some programs use these parameters but often with approximative algorithms (K-function) instead of interpolating real-time data. Others, say 25% of applications simply ignore the working conditions like the transmitter properties (mode used or sometime the power), the antenna specifications (gain, takeoff angle, bearing), the noise and interference level at target location, the ground quality (conductivity, dielectric constant) and even the circuit reliability to name several parameters that affect the signal quality. VOACAP (locally executable version) input screen. 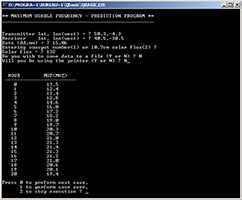 Not less than 26 inputs are necessary to calculate a prediction. Other programs use still more data, sometimes updated in real-time. Why using so many parameters, do you ask me ? Are these additional parameters really useful ? Well, all depends on your needs but you will understand easily that the more data you consider the more complete will be the model and the probability to get an accurate forecast, that it concerns an overview at earth scale or a specific communication circuit between two stations. Of course parameters by themselves do not tell all the story, especially if they are injected in a model using poor and approximate algorithms. It is by far better to use a model using few functions but very accurate, and focus on a single output parameter, than using many data injected in approximative models. In the same way it is better to inject real-time data in functions than median values that do not allow to calculate a real-time prediction, if not with a large uncertainty. These variations mainly occur for short-term predictions or in poor to fair working conditions (low reliability and S/N, disturbances, propagation changing, etc). It is indeed obvious that when propagation conditions are excellent, forecasts are no more used as most bands are open to milliwatt; conditions experimented yesterday will be, with a little luck, always valid today and next week. In these excellent conditions, even used bare foot, a small transceiver connected to a whip antenna could reach DX stations at the first call, or almost ! But everybody knows that as soon as you worked during the maximum of the solar cycle. What amateurs requests are accurate forecasts either whenp ropagation conditions are changing or for specific working conditions. And in this context, very few programs are powerful and flexible enough to give accurate results. But can we really improve this accuracy ? This is the subject that we are going to deal with in the next chapter. A.F. Barghausen et al., Predicting Long-Term Operational Parameters of High-Frequency Sky-Wave Telecommunications Systems, ERL-110-ITS-78, Institute for Telecommunications Sciences, Boulder, Colo., May 1969. A complete list of trans-horizon radar studies is available at CUFON as well as at ITS (PDF).